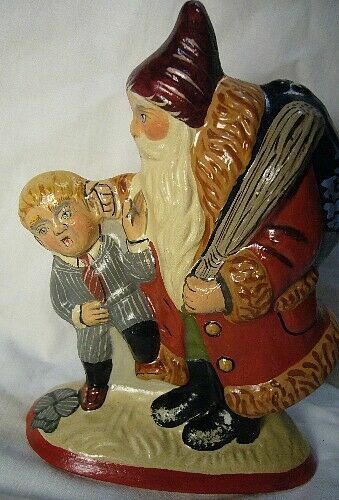 Santa having caught the rascal?despite his proper attire?in time to speak with him about how a good boy should act. Santa Dressed in red, this European figure has brown fur and is holding a switch in one hand and caring a deep blue sack decorated with a white winter?s tree. This is the companion piece to the Santa Giving Doll to Good Girl also . The Piece is personally signed by Judi Vaillancourt the Artist and Hand Painted by Artists at Vaillancourt. A All American made in American Holiday Collectible that will be in your family forever. It measures 6 x 4.5 x 2.25 inches and is in perfect condition.